Jordan and James were married at the Ault Park Rose Garden in late May. Jordan carried a romantic bouquet of the palest blush and peach flowers with peonies, Juliet garden roses, astilbe and sweet pea. The bridesmaids carried simple bouquets of sweet pea and foliage. Jordan picked up forty-five bud vases full of blush flowers and foliage for the reception the day before the wedding. She styled the vintage vases along with other props down the center of the dining tables at The Carnegie Center with the help of her friends. I can’t wait to see how the tables turned out! Congratulations to Jordan and James! Brianna and Nate were married at the The Little Red Schoolhouse in late May. 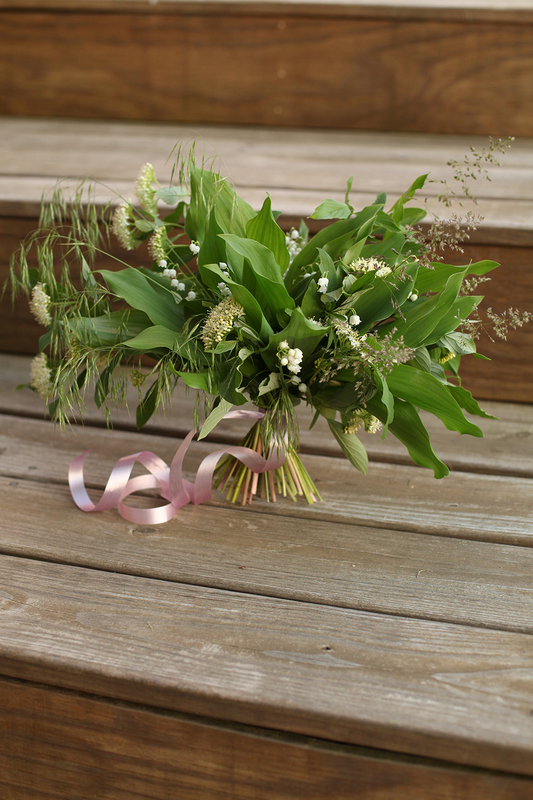 Brianna carried a green and white bouquet with astilbe, scabiosa, sweet pea, bunny grass, variegated Solomon’s seal and ferns. The bridesmaids carried bouquets of scabiosa, sweet pea and foliage. Congratulations to Brianna and Nate! From a recent trip back to Michigan, gathered from my old garden.